Ronald and Christoph Wahl formed Wahl Organbuilders, LLC in May 1999 on the occasion of purchasing the historic Temple Zion in downtown Appleton. 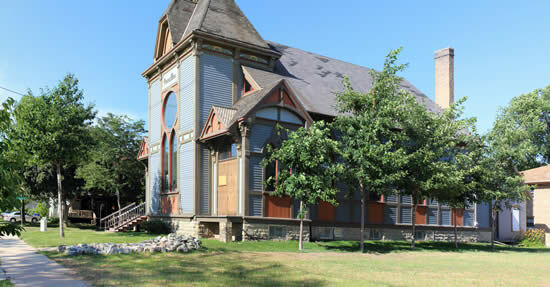 The building was completed in 1884 for the Temple Zion of Jerusalem congregation with funds donated by members of the general Appleton community. 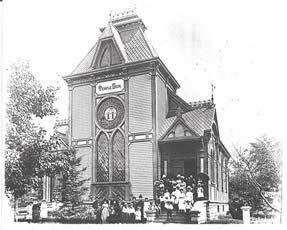 The congregation was comprised of many immigrant settlers who quickly became pillars of the young Appleton community. The original president of the congregation was David Hammel, a livery stable owner who was also a mayor of Appleton. The building remained a synagogue until 1932, when it was purchased by the First Assembly of God. Temple Zion is a wonderful example of 19th century vernacular architecture. As mentioned by several visiting architectural and religious historians, one can see that it is not especially Jewish in style but rather a unique religious space as interpreted by Midwestern German craftsmen. The building was designed by Charles Hove. By 1999, the building was empty and had serious visual and structural problems that could have lead to condemnation by the city. Wahl Organbuilders restored the exterior of the building to its original appearance with a phased program of restoration. All four sides of the building proper as well as the smaller 'schoolhouse' building east of Temple Zion have been restored to original colors as documented by recovered paint samples. 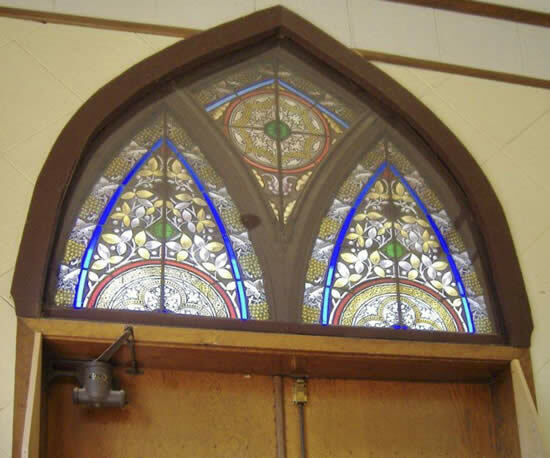 The only remaining original stained glass windows are positioned over the north and south entrance doors on the west end of the building. The south glass panels are complete but the partially damaged north panels await restoration. In April 2013 Wahl Properties purchased and cleared the adjacent lot to the south. For the first time in a century there is room for a complete view of the buildings from a distance. 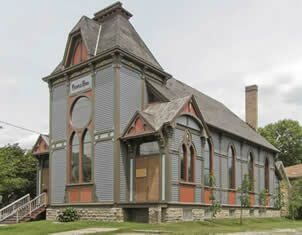 Temple Zion is on the National Register of Historic Places. 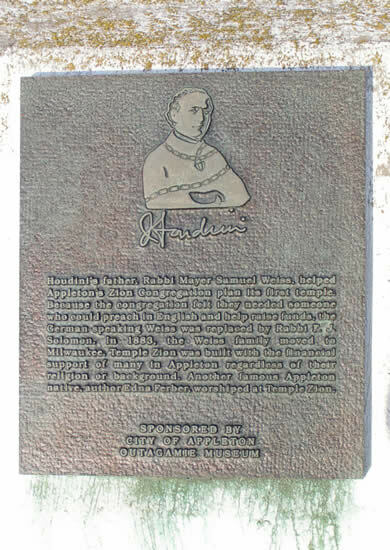 The Houdini plaque on the concrete pillar in front of the entrance is one of multiple such plaques in Appleton's Houdini walking tour. Temple Zion is a key part of the city's history through two Appleton natives who went on to national prominence: Harry Houdini and Edna Ferber. Houdini's father was the rabbi at the time of the building's construction. Harry was seven when the family left for Milwaukee and he for fame as a magician and escape artist. Edna Ferber was the first female reporter for the Appleton Crescent in the early decades of the 20th century. Interestingly, the 19-year-old Ferber interviewed the then famous Houdini on July 23, 1904 for the Crescent when he returned to Appleton for a visit. Ferber later moved to New York City and is known for her books, perhaps the most famous being Showboat that was made into the musical by Jerome Kern and Oscar Hammerstein II. Temple Zion had an organ installed in 1907. The Augustus B. Felgemaker organ was built in Erie, Pennsylvania and had two manuals and pedal with nine stops. Wahl Organbuilders removed the instrument in 1996 and installed it in the Lawrence Memorial Chapel in 1999.